Howe & Smallwood have opened for business and are employing a number of Oakdale's citizens. At last, with all the delays, the Howe & Smallwood warehouse is finally finished. 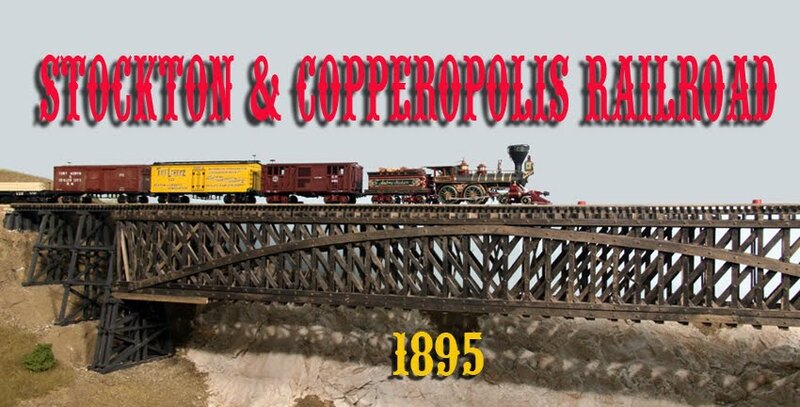 Alongside of it is a new corral so that the ranchers around Oakdale can ship their cattle on the Stockton & Copperopolis. As has been seen in previous posts, I cut one wall away from the building due to lack of benchwork space. This made cutting the roof trusses very interesting and necessitated all of the grain sacks but I think the effort was worth it. These steers will have a while to wait to be loaded as there are presently no stock cars available for shipment. 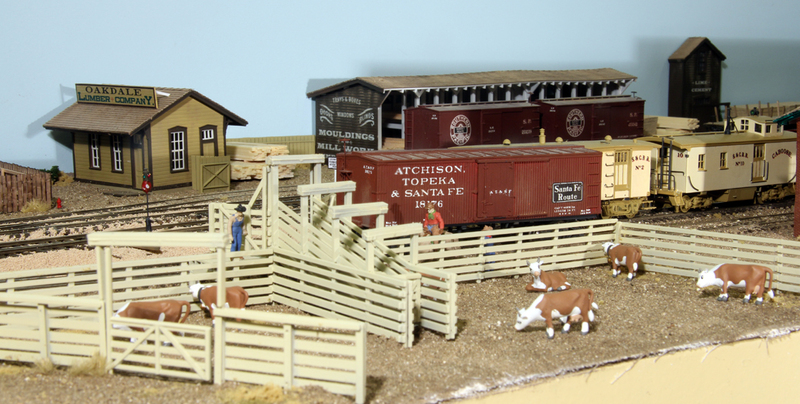 The corral was put together with pieces from a Walthers corral kit. If you look at the layout plan, you can see that the loading chute is just about right at a track switch. For corrals, that is not that bad. Corrals can be located on odd sections of track because cars are not usually spotted there long enough to matter. You can't load a carload of steers and let them set so the train has to be ready to leave town when the cars are loaded. How long does it take to load a car? I will be setting up a sound module with a recording of mooing steers. When the sound stops, one car is loaded. Spot the next car and do it again. Right now, I don't have any stock cars on the railroad so that traffic will have to wait a bit. Quite a number of figures were needed to complete this scene. The cows were prepainted by Woodland Scenics while the cowboys started out as unpainted Preiser figures. 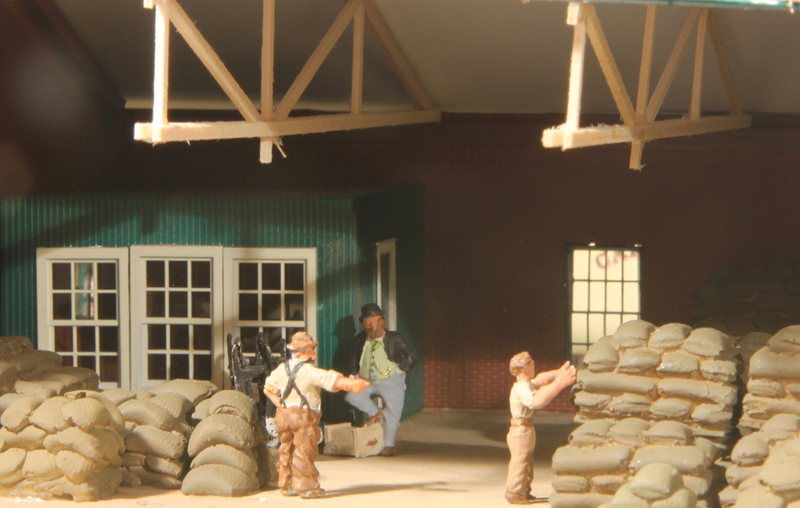 The boys in the warehouse were a combination of old cast metal Lytler & Lytler and Gandy Dancer figures that I have had forever. It was time to use them. Of course, wagons full of grain sacks had to be brought in my the farmers so I built up a couple of kits that I had in stock. The green wagon is a Lindsey which is made in the United Kingdom while the brown wagon was made by Imagine That Laser Art (www.imaginethatlaserart.com). It is laser-cut wood and very easy to assemble. Farmers delivering grain are guided into position by warehouse workers. The white substance is unpainted Sculptamold which will eventually be covered with dirt and growing things. Running out of shingles can sure put a damper on a model's progress. I thought I had enough to finish the new Howe and Smallwood grain warehouse but I did not. Even though I ordered more, it took a few weeks to get them made and in my hands. The material I use is from Minuteman Scale Models (www.minutemanscalemodels.com) and is a very good product. I have used them on several of the buildings in Oakdale and elsewhere. They come in strips and have a peel-off backing so the strip can just be stuck down on the roof of the model. I highly recommend them. Casting the grain sacks to populate the warehouse took a bit of time as well. I used up the last of my casting resin which, fortunately, was enough to finish the job. In the 1890s, before forklifts, warehouses generally only stacked things about eight feet high. That was as high as a man could reach. A few hand trucks completed the interior. The terrain on the warehouse site was not quite level so I used some Sculptamold to fill in the low spots. It still needs to be painted and have dirt, etc. applied. There's still a bit of scenery work need plus a wagon or two delivering grain to the building. 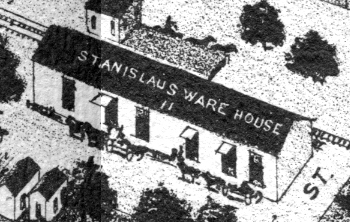 An 1885 bird's-eye map of Oakdale yielded this view of the warehouse. With the side of my model cut off, I could only show one door and one window. 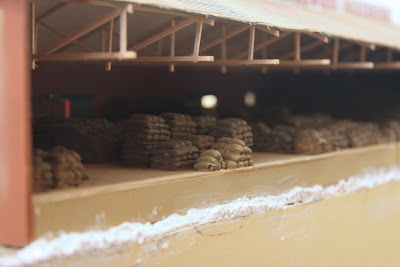 The prototype of this warehouse was built in the early 1870s and was a brick building like the model. It was 400 feet long while my model was cut back to 200 feet. They must have moved a lot of grain in those days! By 1895, the building was gone, probably due to fire although I have found no confirmation of that. I would probably have to go to Oakdale and read through the Oakdale papers to see if there was any mention of a fire. Although the prototype building at this site was one of the Stanislaus Warehouses, I used the name of another warehouse in town just to give some variety to the scene.